Contemporary artist Damien Hirst is best known for his headline-grabbing conceptual artworks, which include animals suspended in formaldehyde. One of the biggest hitters in the art world, Hirst has chosen to put that all to one side and return to the craft of painting. The exhibition of his new work, which has opened at the Wallace Collection in London, has been scrutinised by numerous art critics. 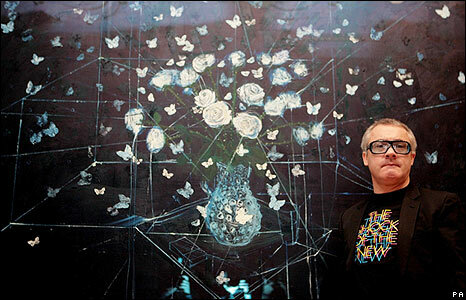 Damien Hirst has painted some paintings, entirely by hand. So far he has made his name with other kinds of art: with assemblages, mainly involving dead animals and pills, and paintings, painted by other people. But now he has risked his fame, with some paintings done by his own hand. They're thoroughly derivative. Their handling is weak. They're extremely boring. Hirst, as a painter, is at about the level of a not-very-promising, first-year art student. He is in his mid-forties. The effect is, initially, dazzling. Hirst has lined the walls of two long galleries with striped blue silk wallpaper, commissioned at his own expense from the same French factory that makes the paper for all the Wallace's walls. The problems with the exhibition begin when you study the paintings themselves. Although they have impact as a group, individually many of the paintings simply don't pass muster. Details are tentatively painted; compositions fall apart under scrutiny. So it is brave of him to begin to paint in this way  but anyone who first encountered Hirst through these works would be entirely justified in wondering what all the fuss had been about. Hirst's paintings lack the kind of theatricality and grandeur that made Bacon succeed. At its worst, Hirst's drawing just looks amateurish and adolescent. His brushwork lacks that oomph and panache that makes you believe in the painter's lies. He can't yet carry it off. Whatever his borrowings, Hirst did all this himself, unaided by his armies of assistants. He fills up his art with dead things: even the iguanas look stuffed. 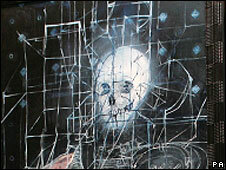 But these paintings are a memento mori for a reputation. The paintings are dreadful. Think Francis Bacon meets Adrian Mole. So why are these works now hanging in the Wallace Collection? What are they doing in the home of such masters as Rembrandt or Poussin, Titian or Fragonard? The answer is simple: they are by Damien Hirst. Take a step farther and a pale, silk-papered boudoir transforms into what feels more like a teenage boy's bedroom. You can almost smell the brooding odours of existential angst. The artist who has made his reputation with shock now produces works that are shockingly bad.